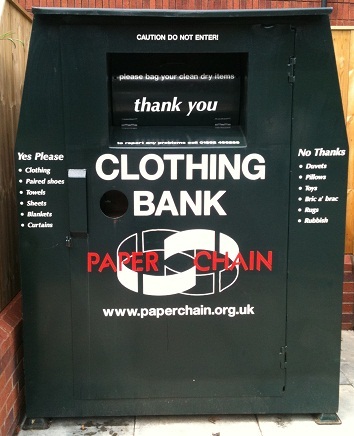 By using our clothing banks you are helping to reduce waste, save resources and to provide a cheap supply of clothes to people in poorer countries. The collected textiles are graded according to their condition in this country creating employment opportunities here in the UK. Good quality items suitable for re-use are either re-sold in the UK through charity shops, or sent abroad to developing countries. Lower quality items are recycled; cut up to be made into things like wadding, dusters and hospital & industrial wiping cloths. Please deposit only clean and dry bagged clothes, shoes and textiles in our clothing banks. Soiled and wet textiles cannot be re-used or recycled and can contaminate the better quality items in the banks. We do not take duvets/quilts, pillows, bic a' brac etc. Do you have textile material left over from a car boot, jumble sale or fete? We will support your cause by buying your left over textiles from you if you bring it to us (please call to arrange a convenient time to drop it off) This is an excellent fundraising opportunity for any not-for profiit organisation and we may be able to supply you with your own clothing bank. The money Paperchain raises from this activity helps us to increase our recycling activities in Exeter and to promote awareness of waste reduction and recycling.